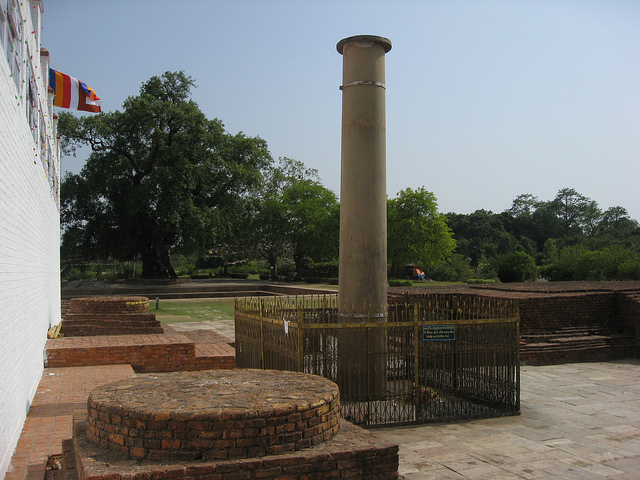 The Ashokan Pillar in Lumbini Nepal is a part of the series of other Ashokan pillars that Ashoka liked to erect at places he visited or write inscriptions about his visit on some other pillars. What is common between all these pillars at different places is that he more than often placed them in monasteries and places with Buddhist significance. The pillar in Lumbini has inscriptions of King Ashoka visiting the place and making it a tax-free site which it till date remains. The pillar was erected during Ashoka’s reign but was lost and unnoticed until a bunch of archaeologist found it and over took an excavation to reach to the right conclusion about this area. Situated right next to the Mayadevi temple in Lumbini the Ashokan pillar is easily accessible and quite famous.